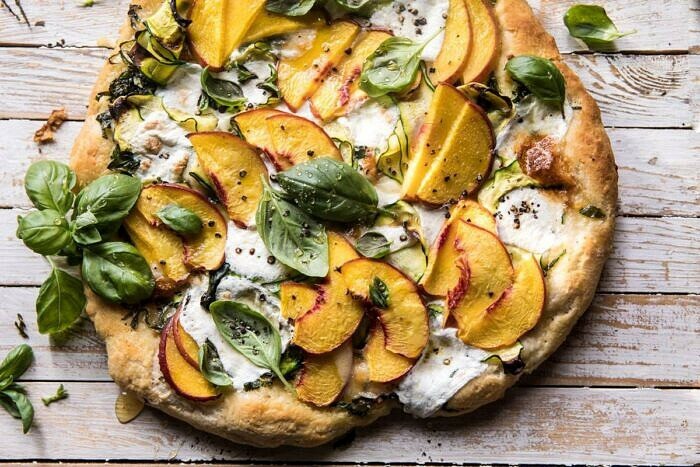 Pesto Zucchini and Peach Pizza with Burrata. 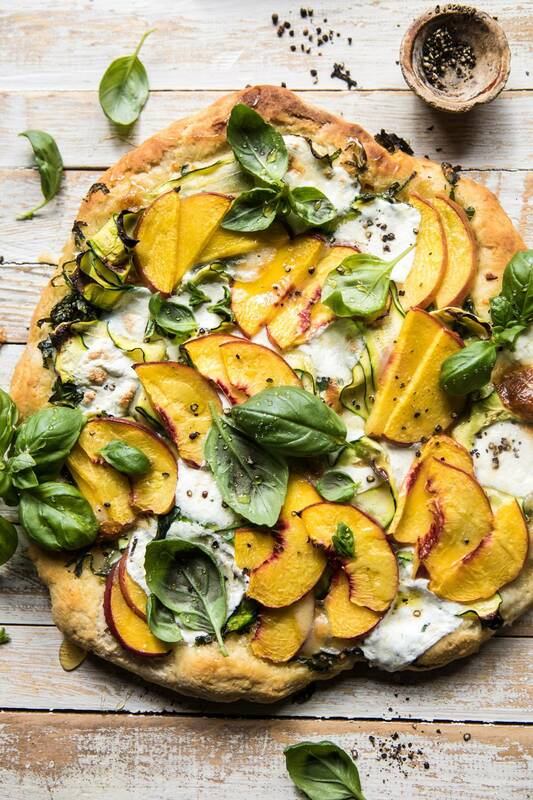 Pesto Zucchini and Peach Pizza with Burrata. 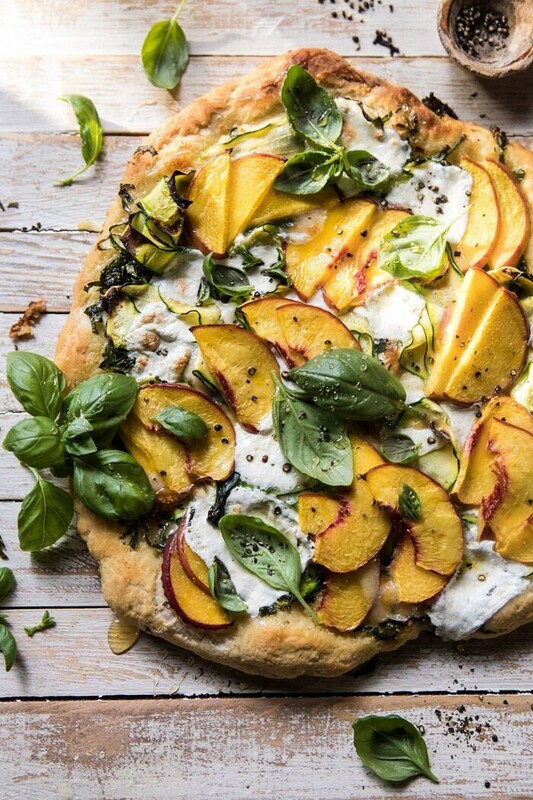 All of summer’s best produce on a pizza! Three of my favorite cheeses, fresh garden herbs, sweet peaches, savory zucchini, and a little bit of spiciness to balance it all out. It’s the only pizza recipe you need this summer…it’s true! Welcome to August everyone! We’ve officially entered the last full month of summer and it’s both making me sad and excited. My plan is to live summer to its fullest all August long. 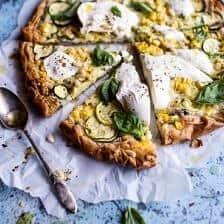 August is one of the best months of the year for peak produce, so I have big plans to share plenty of fresh zucchini, corn, tomatoes, stone fruit, and berry filled recipes. I’ve been in New York since Monday and every farmers market is bursting with colorful fruit, vegetables, and flowers. It’s kind of amazing and I love it. I’m in the city for work, but I’ve been walking to as many meetings and events as possible, trying to experience as much of the city as I can. I spent most of Tuesday uptown around central park and Rockefeller Center, while today will be spent mostly in the Soho area. It’s a quick trip, but I’m hoping to spend more time here in the fall. I’d love to see the changing leaves in Central Park or watch the tree lighting in Rockefeller center…or maybe even both! Clearly, I am loving NYC, but then who doesn’t? I’ll be flying to Cleveland later tonight to spend a couple of days visiting family before heading back home to Colorado. My parents, Asher and most of my brothers are already there, and since I’m already on the east coast, I figured I’d spend a little time back in my hometown. The last time I was there was for Thanksgiving and it was craziness, so this trip should be a little less, um, eventful! I’ll share more on both NYC and Cleveland in Sunday’s favorites post. So that’s a little recap of what’s happening on my end. Let’s chat all things pizza now! I’ve made it pretty obvious that I love fruit, cheese, and carbs. It’s also obvious that I love using fruit in ways you might not expect, enter this pizza. It’s a little different, but it’s also delicious, and I’ve been dying to tell you about it pretty much all summer long. I’ve mentioned this before, but sometimes I’ll hold out on sharing a recipe with you guys until it is just the right time. I’ve been making this pizza since the beginning of June, but I had to wait to share until peach season was in full force. Now that it’s August, the peaches are ripe, delicious, and ready to be used for everything from sweet pies to savory pizzas. Alight, here we go. The details. First things first, you need pizza dough. I always make my own because it’s honestly just so easy. All you need is flour, yeast, honey, and water. Mix, let it rise, and you’ll have your pizza dough. My favorite recipe is in my cookbook, but I also have a recipe on the blog! All this said, I totally get that life is busy, and making homemade pizza dough might not be something you’re up for at the end of a long day. If this is the case for you, go for store-bought. Most grocery stores have pretty good dough. Tip? For the best pizza crust, make sure you’re using room temperature pizza dough. If the dough is cold, it will be much harder to work with, and won’t bake properly, so make sure your dough is room temp! 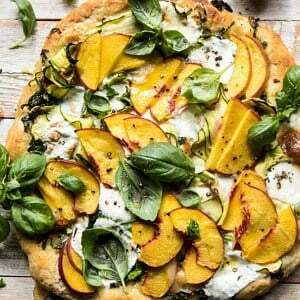 When I set out to make this pizza, I knew I wanted to include two things, lots of fresh herbs and peaches. I haven’t talked too much about our garden lately, but it’s literally bursting with fresh herbs, cherry tomatoes, and pepper plants. Both the tomatoes and peppers have a couple more weeks left until they are ripe for picking, but the herbs have been growing strong since June, and I’m up to my ears in fresh basil, oregano, dill, rosemary, thyme, and sage. Literally up to my ears. We have more basil then I know what to do with, so I’ve been making batches of pesto almost weekly. I am loving having pesto on hand for easy dinners, it’s perfect for tossing with pasta or using for pizza! So, I spread the dough with a good amount of basil pesto, but I also added some fresh sage and a sprinkle of sesame seeds as well. I was loving the combo of basil, sage, and peaches. It’s light and summery, but the sage gives the pizza a slight cozy feel too, which you know I love. And the sesame seeds? Well they are just addicting, I’ve been using them on everything this summer. They add just the right amount of flavor. I then layered on a mix of fontina cheese and manchego, but feel free to use a combo of you favorites. Next add the zucchini ribbons and thinly sliced peaches, finish with burrata, and then into the oven. 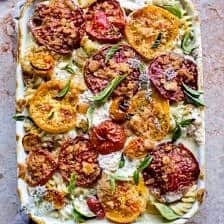 The peaches caramelize, while the zucchini ribbons get crisp, and the cheese melts over everything. When the pizza comes out of the oven, finish it off with a handful of fresh basil. And then done. You have the best Wednesday night (or any night) pizza, and it took maybe thirty minutes to make, total. So simple. So easy. So perfect for summer. SO GOOD! 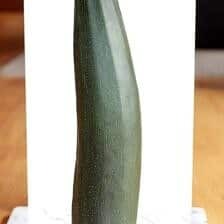 Also, if you happen to be growing zucchini this summer, this is the perfect recipe to use it all up. Just saying. 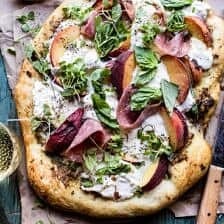 If you make this Pesto Zucchini and Peach Pizza with Burrata please be sure to leave a comment and/or give this recipe a rating! I love hearing from you guys and always do my best to respond to each and every one of you. Oh, and of course, if you do make this recipe, don’t forget to also tag me on Instagram so I can see! Looking through the photos of recipes you all have made is my favorite! 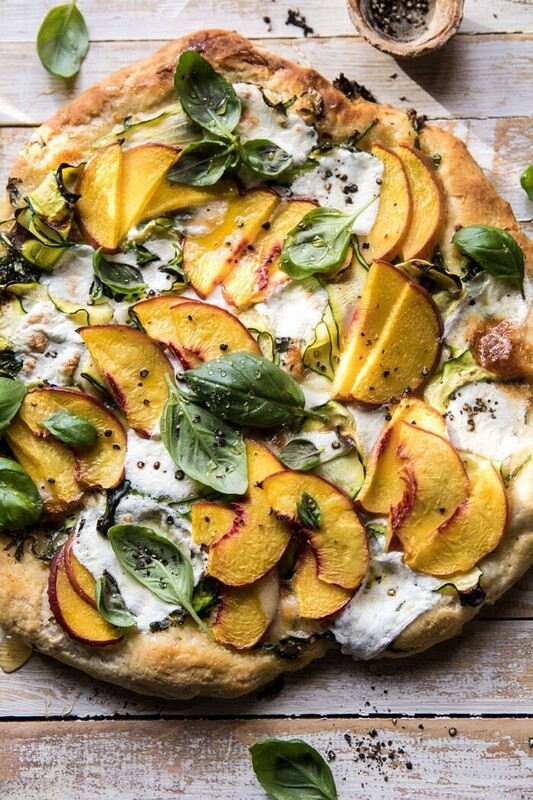 All of summer’s best produce on a pizza! Three of my favorite cheeses, fresh garden herbs, sweet peaches, savory zucchini, and a little bit of spiciness to balance it all out. 1. Preheat the oven to 450 degrees F. Grease a large baking sheet with olive oil. 2. On a lightly floured surface, push/roll the dough out until it is pretty thin (about a 10-12 inch circle). Transfer the dough to the prepared baking sheet. Spread the dough with pesto, sage, sesame seeds and crushed red pepper flakes. Layer on the fontina, manchego, zucchini and peaches. 3. Drizzle the zucchini and peaches lightly with olive oil. Sprinkle with salt and pepper. Break the burrata over the pizza. 4. Transfer the pizza to the oven and bake for 10-15 minutes or until the crust is golden and the cheese has melted. Sprinkle on the basil, and drizzle with honey. Slice and enjoy! 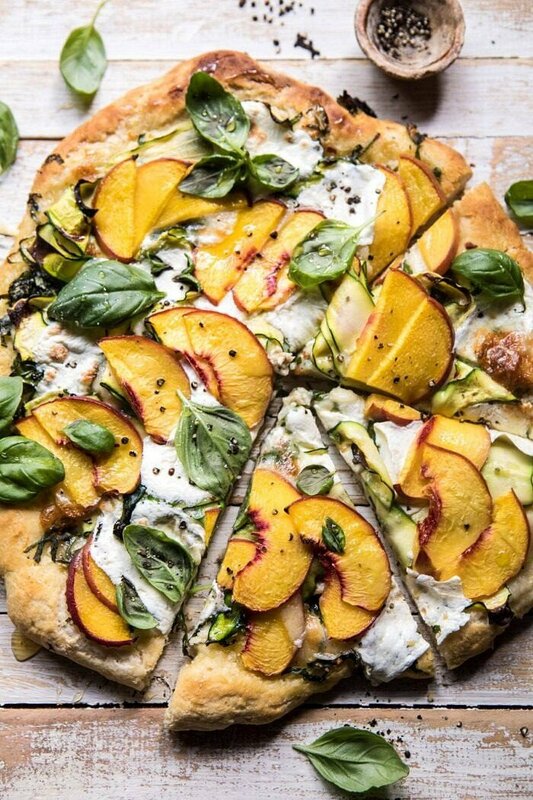 Peach Burrata Pizza with Honey Balsamic. 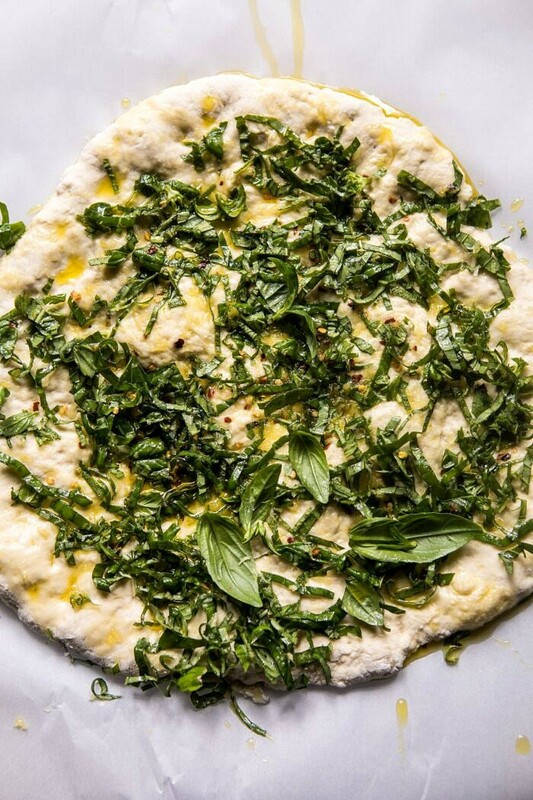 Oh burrata…how I love thee – need this pizza in my life immediately – thanks for sharing!! I hope you love this Rebecca! Thank you! Hi Liz! You can send an email through my contact page.. contact@halfbakedharvest.com. Cant wait to hear from you! Peaches on a pizza ?? Oh dear, the Tieghan-touch again! 🙂 As someone wrote not long ago, we also think there are too many sweet/savoury dishes lately. We love fruit, but not this way, sorry, even if it does look great! To each their own! I hope you try this though.. I swear its the best! Oh how we loves peaches. We just came back Sunday from going to SC on Sat and picked up 21 boxes of peaches. I only got 2 for us. HahHa!! I got for family, friends and teachers I used to work with. Can’t wait for more to get ripe. Only had 3 that were soft enough to eat. Peach cobbler will have to be on the list to make. What a fantastic recipe. 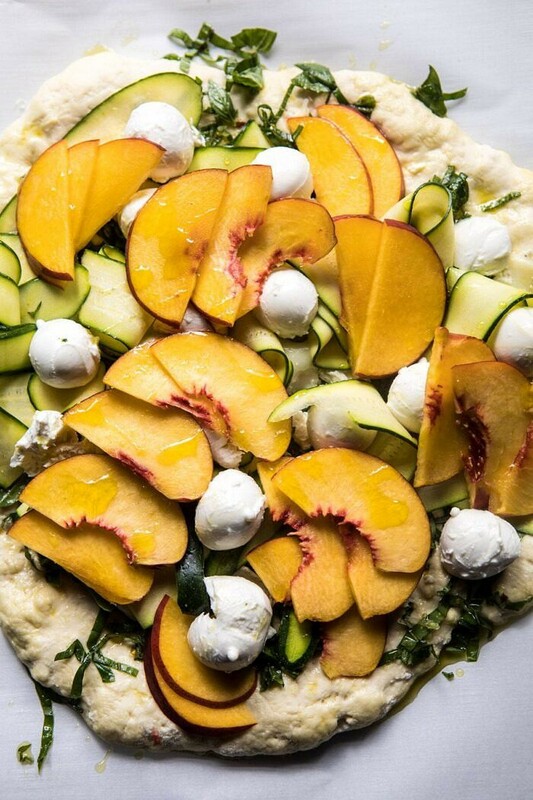 The flavour combination of juicy peaches, pesto, zucchini and burrata must be out of this world. Will try for sure! <3 Thanks for the inspiration! Thank you so much! I am so glad you like this! Thank you Kori! Love that you dry them! So perfect! Thank you Brittany! I hope you love this! Made this tonight. Very tasty. Loved the peaches on this. I wouldn’ have thought to do that. I think next time I may add some cubed chicken. The only thing that didn’t work for me was the sage. So going forward I’ll replace that with thyme. Thanks for a fun pizza. I enjoy the sweet/savory combos. Nice change up. Made this tonight and it’s absolutely delicious! Restaurant quality pizza 👌🏻 I’ll definitely make it again before summer is over.